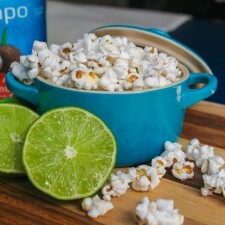 Coconut Chili Lime Popcorn - Yum! As things begin to thaw out from the torrid winter months, we might be thinking about those “eating healthier” promises we made to ourselves oh so many months ago. Let’s be honest, everyone signed up for new gym memberships, pinned dozens of “green smoothie” recipes, and promised themselves that THIS was going to be the year that they were going to be the best version of themselves, but here in the real world, that is HARD! Because right alongside those green smoothie pins are recipes for salted caramel fudge brownies, and there’s a froyo place right by the gym (“I did 30 minutes on the elliptical, I earned this.” #lieswetellourselves). There are going to be days where all you want to do is throw on yoga pants solely for comfort and plop on the couch to binge Gilmore Girls. Chances are, you’ll want to nosh on something while you do, right? Instead of reaching for the cheese puffs and milk duds, why not try a healthier twist on a movie-night favorite. 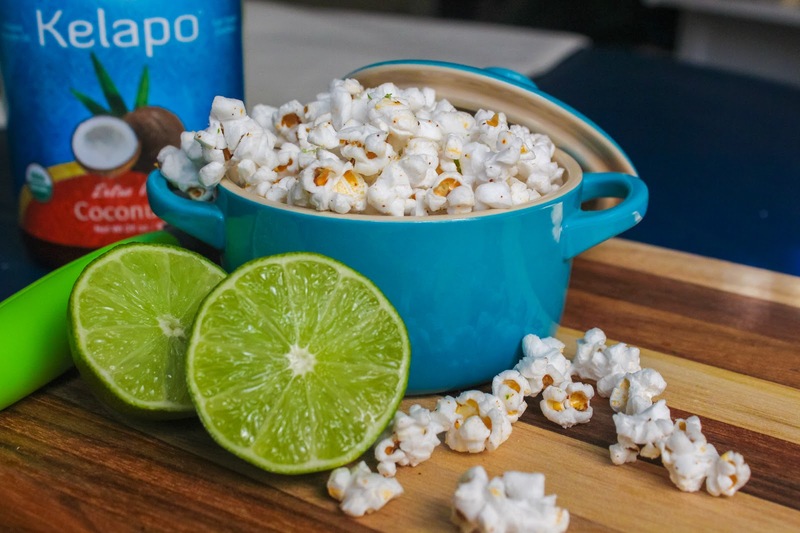 I’ve created a yummy new snack recipe using Kelapo Coconut Oil. Combining the buttery texture of coconut oil and fresh popcorn creates the perfect snack to satisfy that salty couch-potato feeling. A bonus here is that the coconut oil is packed with healthy fat that will help you feel satisfied for a longer amount of time. So as tempting as it will be to down the whole bowl of this treat, you just might be ready to pop! 1. In a heavy-bottom pan, heat coconut oil over a medium-low heat until liquefied. Add in salt and kernels and cover. 2. Don’t leave the pan unattended, things will get popping quickly! Once you hear the kernels start to pop, lower the heat a little bit more and give the covered pan a shake. Let the kernels continue to pop and turn off the heat. The lid may start to raise up, that’s totally fine. 3. Dump the freshly popped kernels into a large mixing bowl. Quickly add in the juice of half a lime, chili powder, and a pinch more salt. Give everything a few shakes to combine the ingredients and serve! Keep up with Kasey on Facebook, Instagram and Pinterest! Original recipe and photos by Kasey Potts of Kasey’s Kitchen. I just purchased your Extra Virgin Coconut oil in the can. I sprayed it on my air popped popcorn and added a little salt. It was delicious! I do have a question, What is the can lined with? Is there any BPA in it or anything I should be concerned with? So glad you liked the spray! There is no BPA lining in the coconut oil spray or anything that you should be concerned with.